Prineville is located in Crook County northeast of Bend and east of Redmond along Highway 126. This community was named for Barney Prine, local merchant. Prine's merchandise consisted primarily of good whiskey in the front room and some blacksmithing equipment in the back room. The rimrocks that almost encircle Prineville, as well as the region's other geographic features, make the area a favorite place for rockhounds. Other Outdoor Activities include cross-country skiing, hiking, snowmobiling, boating and fishing. 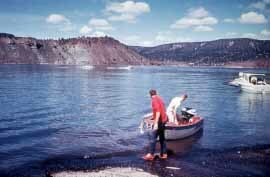 These activities are found at nearby Ochoco Lake State Park, and further south at Prineville Reservoir/State Park. Bike trails, numerous parks and greenways make Prineville an outdoor city from the earliest days of spring until late in the fall. The city has its own railroad, aptly called the City of Prineville Railroad. It's not that uncommon to see people with a boat or a four-wheel off-road vehicle. This is an area for outdoor fun and recreation.